If someone had said to me, "So there's this movie out that plays exactly like a blend of Dogme 95 and the French New Wave," I would surely not have seen that movie. And as it turns out, I would have therefore missed one of the very best films to be released in America in the first third of 2007. 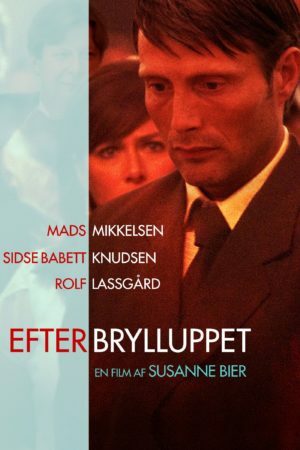 Susanne Bier's After the Wedding (an Oscar nominee for Best Foreign Language film - am I forgetting a year, or did 2006 have the absolute best slate in that category in ages?) opens with a sequence that simply oozes cinema: hazy shots of children playing and suffering in an Indian slum (I believe I recall the city being Mumbai, but I wouldn't swear it) are intercut with shots of Jacob (Mads Mikkelsen), a Danish expatriate working at an orphanage, riding through the slum and observing the life there, and intercut again with Jacob's conversation with the orphanage's proprietor Mrs. Shaw (Meenal Patel), and all of this overlaid with a very elliptically recut version of that same conversation, in which she informs him that he must return to Denmark to meet with a very wealthy man to secure funding for their school. Forgive my clinician's eye for the "what" of this opening scene, but one cannot say an image, much less a sequence of images. The only way to understand the meaning of this sequence, I suppose, is to watch it for oneself, and be amazed at the rhythm and poetry of it. This is Editing 101: the non-arbitrary combination of images in sequence to create meaning out of the space between those images. In this case, that meaning is primarily emotional and not intellectual or narrative - at least, that was the case for me - and I should not be so horrid as to dictate what After the Wedding shall make anyone in particular feel. From the very opening, we see the curious mixture that makes the film what it is: unabashedly Dogme visuals (shot on DV with little to no added light, hand-held shakycam, resolutely unfussy compositions) blended with a very particular editing schema (about which Dogme is agnostic) and an expansive, highly subjective soundscape (which Dogme views as the work of Satan his own self). Bier has been working under the Dogme banner for a few years at this point, and it's not clear to me what instigated her sudden turn to a more expansive, expressionist mode of filmmaking; but it works. God help us all, it works beautifully. Ah yes, there are eyes. "The windows of the soul," or something like that, they tell us, and I'm damned if I can name any movie in history to use eye imagery as much as After the Wedding. Every major character has at least a couple of shots where we just see his or her eyes while a conversation rages on. It's not a reference to voyeurism, at least not that I can tell; rather, it's an attempt to burrow into the mind of the person we're observing. As in so many Scandinavian movies (the noble legacy of Ingmar Bergman), the content of what is being said matters infinitely less than the way that people react to it. Bier's eye obsession is a method of bringing us as close as possible to the characters; to go any further would mean to go inside their heads. And so we study, and we scrutinize, and we see every emotion in the human playbook flashing in four pairs of eyes. Strange, then, that the first eyes we really see aren't even human, aren't even living. As Jacob drives to the home of Jørgen (Rolf Lassgård), the money man, he notices a dead fox by the side of the road. And it is this animal's eye that we first see filling the screen, commanding our attention. Further on, Jørgen's collection of mounted animal heads will provide a menagerie of dead eyes for Bier's frame to linger over and examine. Why these close-ups? These animals are without souls now, why should we stare into their eyes? Because of the contrast, I'd imagine. Death hangs over After the Wedding, not just in the imagery but in the story, and I think the stress given to the dead eyes of dead animals, coupled with the bright, living eyes of the human characters, makes the film "about" their alive-ness. No matter how bad things might be - and they get very, very bad over the course of the story - there is still life. Death comes; but it is not here yet. Nothing about Dogme 95 says you can't do these things; but it still seems radical for Bier to bring such a symbolic metaphoric frame to her movie. Especially considering the ways that the film is pure Dogme: its deliberately gritty look is an attempt to grind in the realism of the film, and its implicit critique against the lives of the idle rich in the face of the suffering of the world's poor, which is never stated and always present, is perfectly in line with the political aims of a deglammed movement like this one. I don't propose to have an explanation; but it is extremely heartening that a movement which, by and large, I have hated for its pretension and it's anti-cinematic bent, can produce a work this revolutionary and perfect, and so fully aware of the possibilities of the art of film.